Yikes, here it is Thursday! I worked on the book. I went to work. I went to see the Jerry Garcia Band. I wrote about it. I went to Pilates. I worked on the book. I went to Zumba. I went out for sushi. I worked on the book. 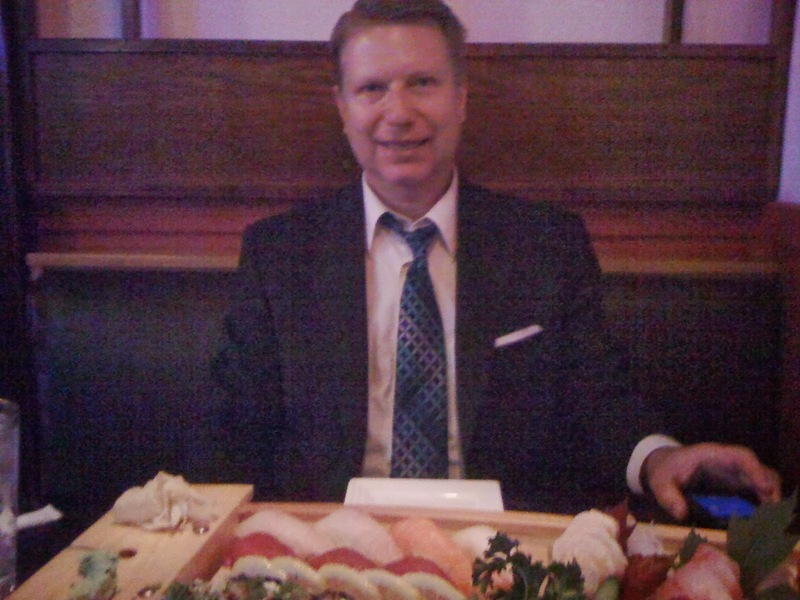 Howard took me for sushi because he was celebrating having filled in for Jackie Jocko down at the Hyatt. Jocko got a flu shot and it turned out that was a mistake. He got the flu! I got my flu shot last week and it hurt but at least I did not get the flu. That makes me feel good. Things could be worse, you know? There are worse things than having your arm hurting. Howard, anyway, played at the Hyatt for an hour and a half and he came sailing home and took me to Tokyo II. I had a coupon because my brother George, on Sunday, gave me his old Entertainment Book to strip. There is a Tokyo II coupon good for $10. Thank you, O Gods of Sushi! Howard has a video of himself playing at the Hyatt. "It's no big deal," he is bragging to the waitresses, tongue in cheek. "He makes it seem like a big deal. It's not." He doodles around on the piano. "Maybe it's because there's no one here." Then next thing you know he is on the phone with the ailing Jocko vamping and going, "Jocko, I'm out of gas. I'm out of things to play. What do I do?" Anyway, he got through it, and there he is up above, celebrating.